Chicago&apos;s stunning landmark was built in 1927 and is one of the largest fountains in the world. 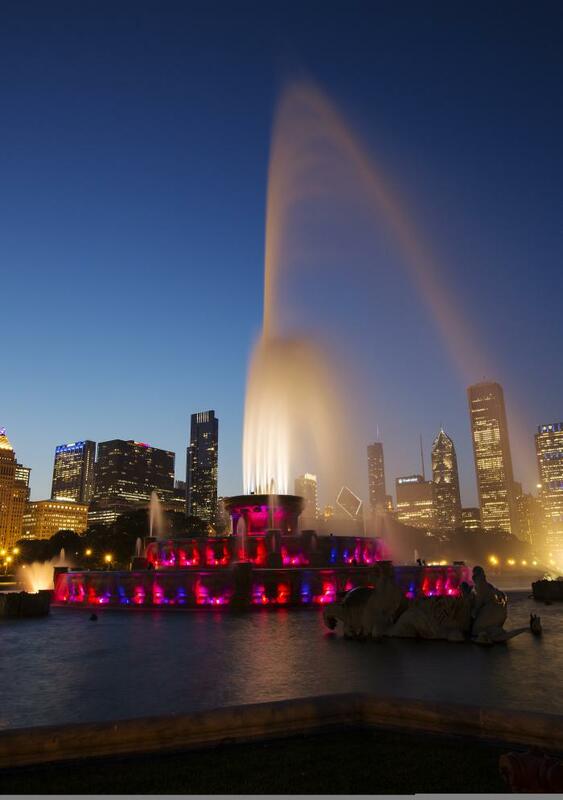 The Clarence Buckingham Memorial Fountain sits as Grant Park&apos;s centerpiece and crowning glory. A gift from philanthropist Kate Sturges Buckingham and constructed in 1927, the fountain is one of the largest of its kind, with a center jet that streams water 150 feet in the air. The structure was designed by Chicago architect Edward Bennet who, along with French sculptor Marcel Loyau and engineer Jazques H. Lambert, built the fountain in the vein of the Latona Basin at Versailles. Buckingham Fountain typically runs from 8 a.m. to 11 p.m. daily, from early May through mid-October. While operating, the Fountain produces an amazing 20-minute water display on the hour, shooting a center jet to a height of 150 feet. While these displays begin daily at 9 a.m., it&apos;s really dusk that you want to plan for. It&apos;s then that a spectacular light and music display takes visitors&apos; breath away, beginning every hour on the hour for 20 minutes. The final major display begins at 10:35 p.m. The fountain is made to represent Lake Michigan, with four pairs of Art Deco-style seahorses that symbolize the four states bordering Lake Michigan&apos;s shoreline. During its more impressive water displays, the fountain circuits through more than 15,000 gallons of water per minute. In total, the fountain contains more than 1,500,000 gallons of water and contains nearly 200 jets.